Excretion is an essential life function. As long as there are living tissues in a body, cells will produce metabolic wastes such as carbon dioxide and ammonia (NH3). CO2 is produced by cellular respiration. Body cells also deaminate amino acids (that is, remove the amino group from them). The 2-carbon molecule produced is metabolically significant and used by cells, but the amino group is converted to ammonia, a waste by-product that is toxic (poisonous) in high concentrations. Ammonia is transported to the liver by the circulatory system, where it is converted to less toxic urea, (NH2)2CO. Uric acid, produced by the metabolism of nucleic acids, is another toxic nitrogenous waste. All of these wastes must be excreted before an accumulation of them becomes life threatening. The primary organs of the excretory system are the kidneys. 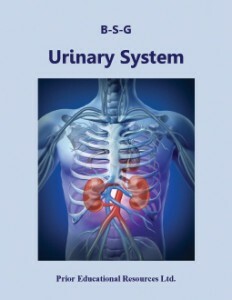 Their structure and function are the focus of the Urinary System biology study guide unit. They extract urea, uric acid, excess H1+, penicillin, histamines, water-soluble vitamins, and other compounds from the blood, and prepare them for excretion by urination. CO2 and some water are also excreted with each exhaled breath. Water is further excreted through skin pores as sweat (though it is arguable that this is a secretion rather than an excretion, because of the useful cooling effect). Urinary System is excerpted from our Biology 12 Study Guide, which is the sixth edition of a student study guide written to match the curriculum of British Columbia. The concepts presented are applicable to the biology curricula of other educational jurisdictions as well.